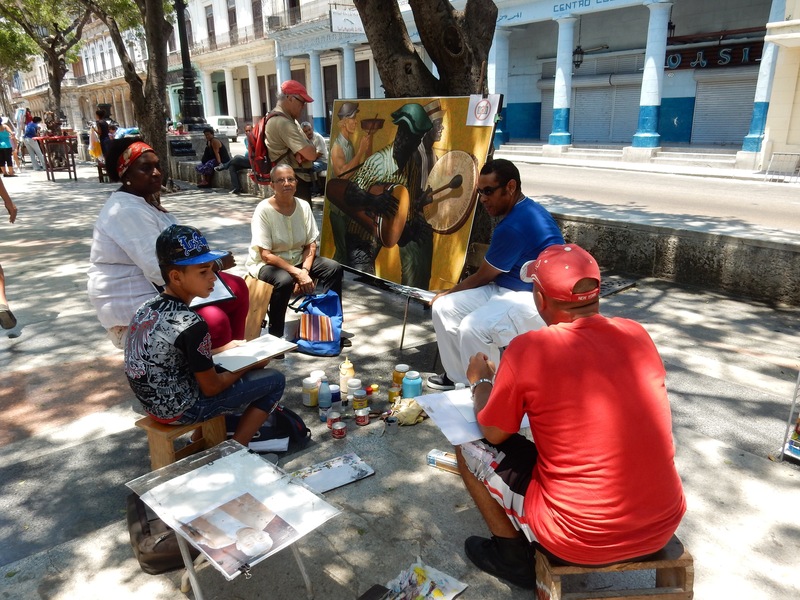 Quiet time in Havana … It IS possible! It is yet another rainy day in Havana and I am relishing the cooler temperatures that come along with it … cool moody Cuban kind of day. 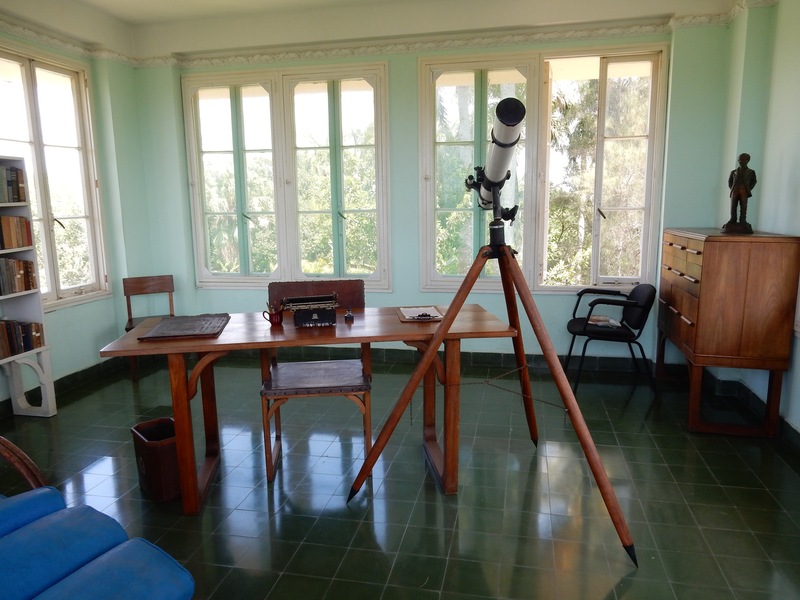 I always like this quiet week to myself after a volunteer posting … a great day for getting lost in thought and reflecting on my time in Cuba. 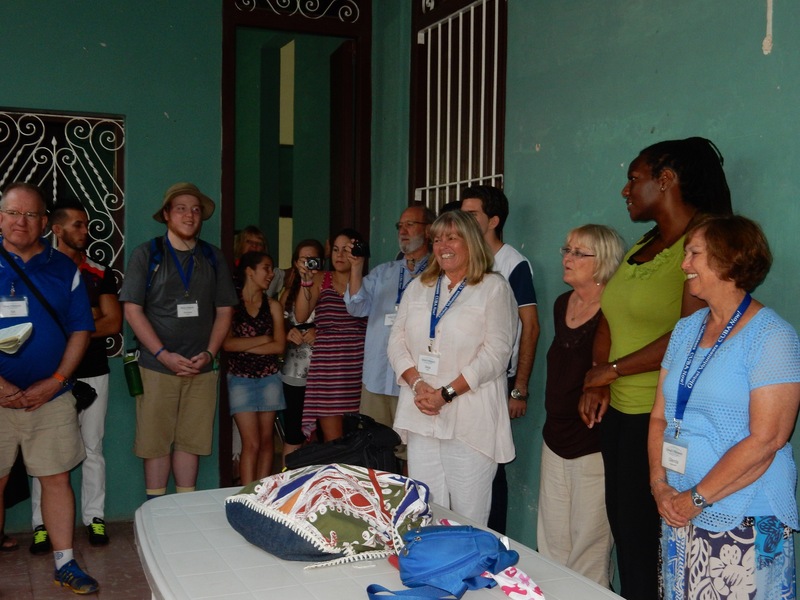 Cuba is a deeply rooted complex culture … so young and vital yet old and cultured at the same time. 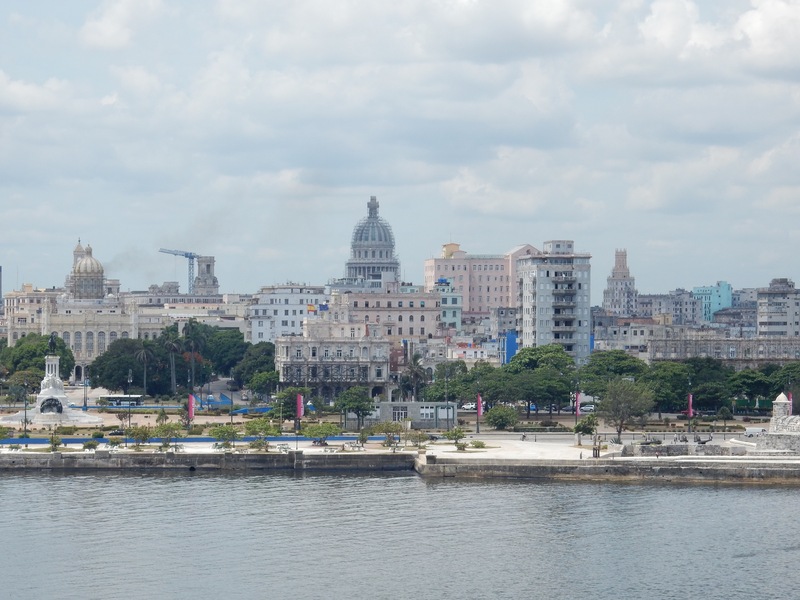 Despite decades of severe economic difficulties, Cuba has held on to a most unique identity within its ethnic mosaic of whites, blacks, native Indians, people of mixed race and Asians who came here in the 19th century to work on the sugar cane plantations virtually as slaves alongside the black Africans. This same ethnic mosaic also characterisizes the culture of Cuba today ….. a place of music and colour, brought together from vastly differing traditions! Over hundreds of years, it has produced a unique blend of people and somehow it all appears to work. Cubans are very sociable, chatty sorts. Their doors remain open for anyone to stop in for a visit, always accompanied by an offer of a coffee or a glass of rum, even here in big city Havana! 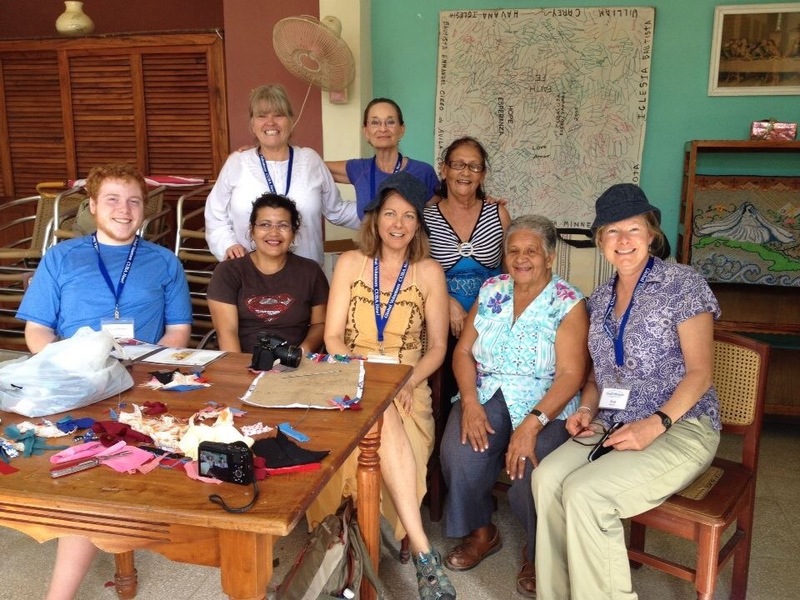 As a group, this was our experience many times, as we walked in Ciego de Avila … some of us taking up the offer 🙂 Not a day goes by that we didn’t run into someone playing what should be the national game, dominoes, be it in restaurants, balconies, benches, or tables set up in quiet town streets and parks … many just sit in rocking chairs outside front doors, always ready with a polite smile. Music is everywhere and remains the soul of this island. Melodic thanks to the Spanish heritage, dynamic thanks to the African heritage. It is both religious and passionate at the same time and like dance, music is a vital part of Cuban life. Casa de la Trova is a Cuban institution in every town on the island, where local bands play and young and old alike go to dance in these clubs. 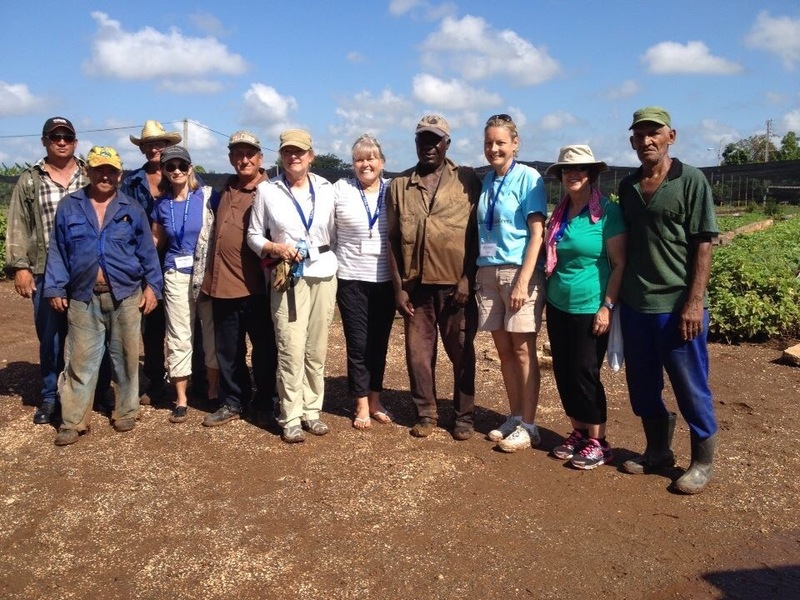 We were invited in Ciego de Avila to a La Trova Club …. too much fun!! Our young students enthusiastically guided and glided us in the Latin style of dancing … I cannot fathom a young teenager wanting to dance with an older person in Canada but it is common place in Cuba!! I want to learn to move like these kids!!! 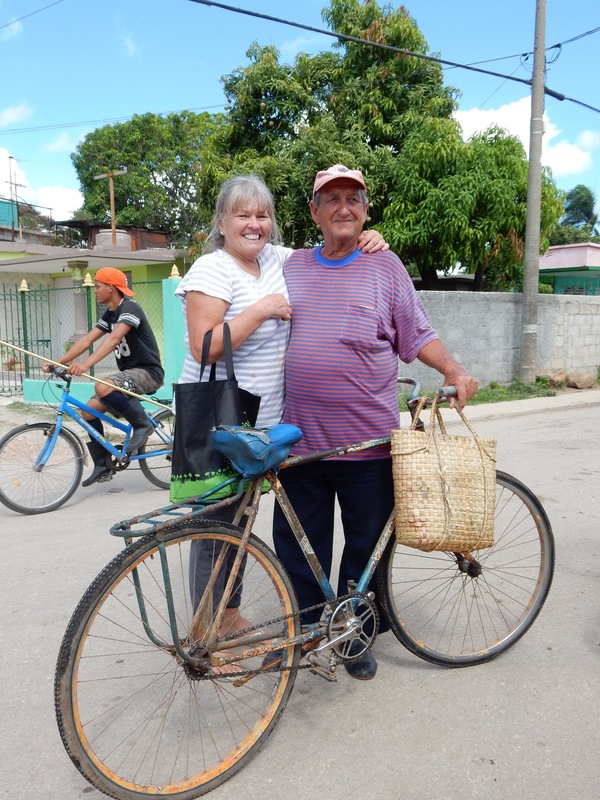 In Ciego de Avila, we were driven back from our evening classes every night by horse drawn carriages. There are few taxis available day or night in a small town and certainly never enough for our large group of 14. It became so commonplace for us to utilize the bicitaxis (bicycle with a seated cart attached behind ala Thai style) during the heat of the day in particular, but walking was our main mode of getting to our work morning and evening. The horse carriages at night! 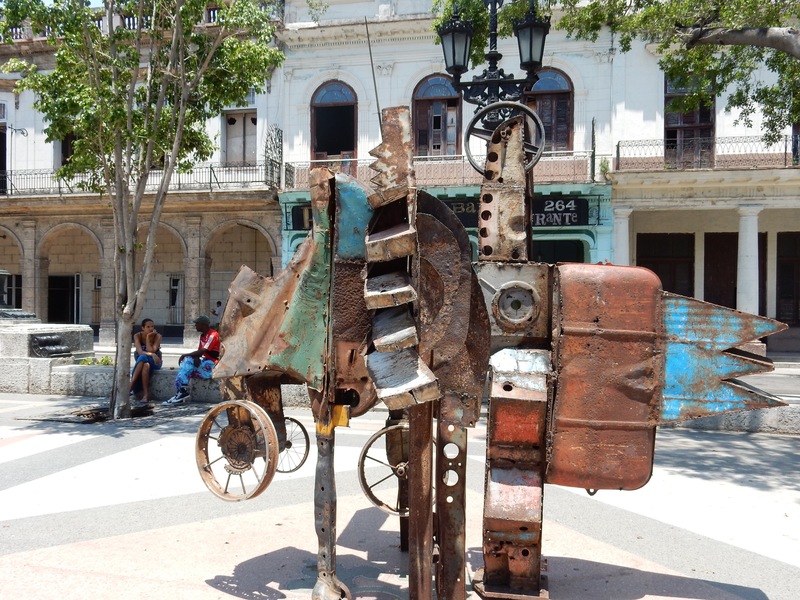 Here in Havana, the horse and carriage is a touristic thing to do 🙂 and hence way costlier than in a small town where it is considered a most common method of transportation, even in today’s modern world! How quickly we all became used to it. I think I will hire a horse carriage today just because I am missing it so much. Perhaps a trot around the parks is in order! 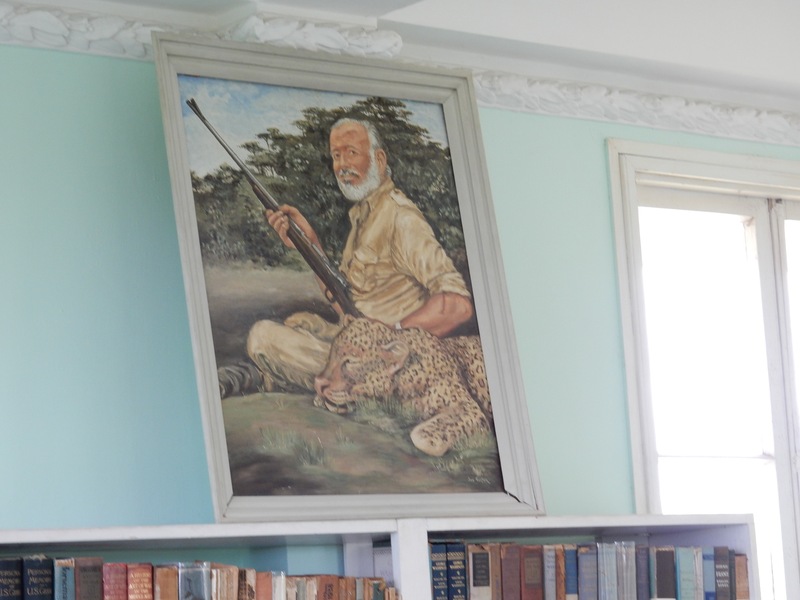 Enjoyed our group stop last Thursday at ‘Hemingway Museum’ … Ernest Hemingway lived on the outskirts of Havana at Finca La Vigia on a beautiful acreage for over two decades … his two known loves here were journalist Martha Gellhorn and Mary Welsh … he married both during his time in Cuba …. (although I believe he also had an ex-wife or two in America, romantica womanizer that he was). 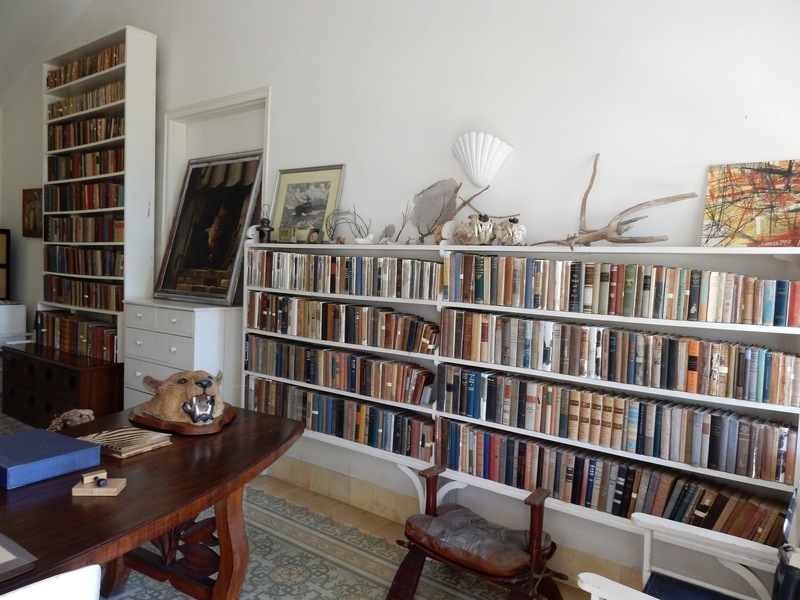 During this time in Cuba, Hemingway wrote his more famous books. Will have to revisit these again at some point although I do not remember enjoying them much in my youth. 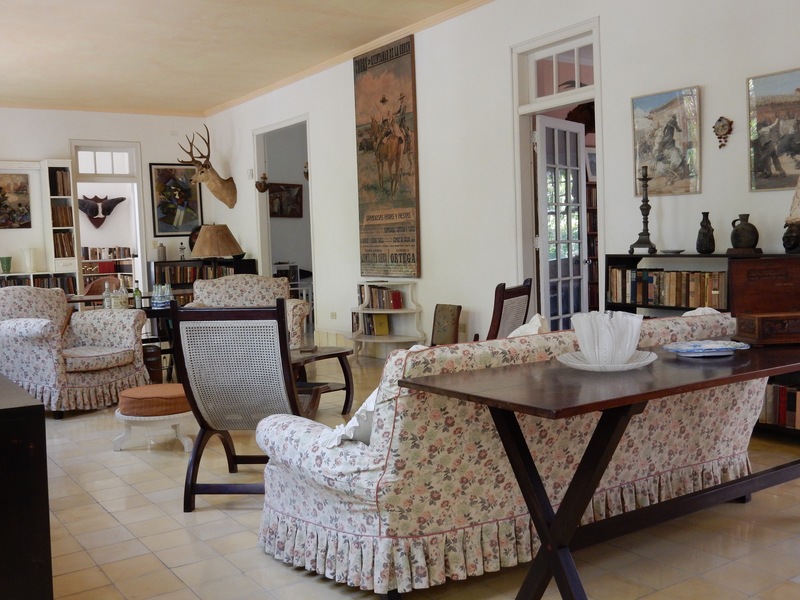 He was at Finca La Vigia when he found out he had received the Nobel Prize in 1954 … news to which he promptly replied, “This prize belongs to Cuba since my works were created and conceived in Cuba” … he lived here from 1939 to 1960 when he moved back to the U.S. where he committed suicide a year later … personally, I think he left so much of himself back in Cuba that he could not quite reconcile a less colourful life back in America … or maybe he was just a sad melancholic alcoholic. 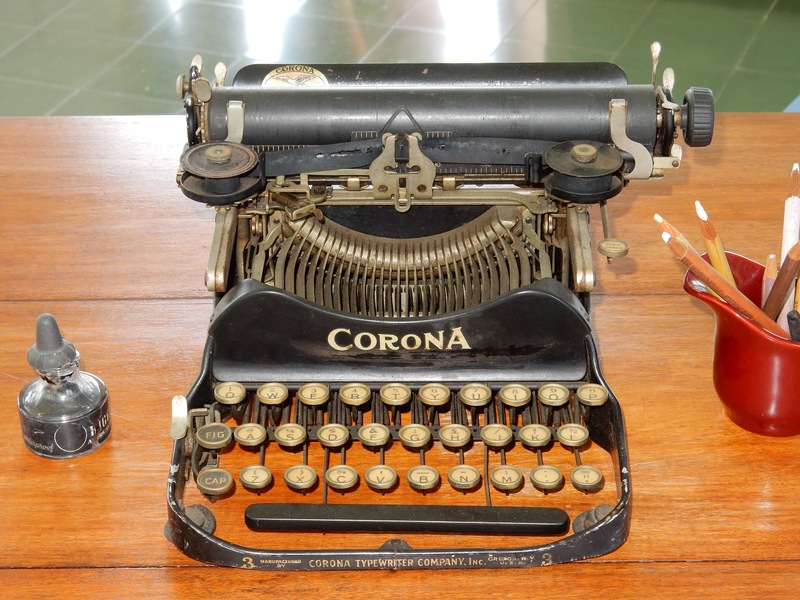 Ernest Hemingway’s typewriter, the age old manual Corona, sits in his loft writing room, waiting for creative fingers to tap out another award winning book. Judging from the numbers written on his bathroom wall, Ernest suffered from the typical North American obsession with body image (who knew??) 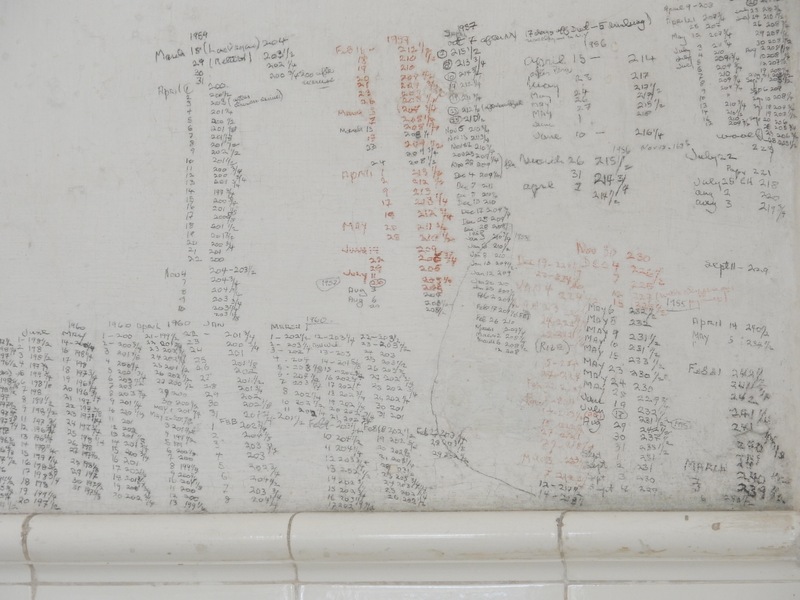 … he kept records of his weight losses and gains, jotting the fluctuations on his bathroom wall, beside his scale …. probably an abundance of his own signature daiquiri drinks contributed greatly to his growing girth …. funny little Ernie tidbit. As I walk around Havana, I am reminded frequently, what a lucky long straw we of the Western world pulled. We enjoy a wealth of riches on so many fronts. At the drop of a hat, we can travel anywhere in the world if our finances allow, with no special permission, questions or visas required! We have an embarrassing array of food, clothing, books, gadgets available to everyone, on every shelf, in every store, cars for most people!!! … we have choices!!!! So many in our world just do not enjoy even a fraction of what is available to us. I literally cringe inwardly at times when I listen to the average Canadian complain about their lot in life. I have been fortunate to travel extensively and have seen first hand the hardships that 80% of our world lives under every single day … mere survival is the main component to their days, every day!! …. I am personally going to work on my own silly senseless complaints … so easy to get caught up in when living in the comforts of a Canadian life. Got caught in a major tropical downpour along the Malecon on my afternoon walk the other day … I was heading to the little fort restaurant at water’s edge in nearby Vedado area. It had looked so charming last week when we all arrived in Havana and I well remember saying I must stop there for a spell at some point for a coffee and the common delicious coconut flan that seems to be served countrywide!! 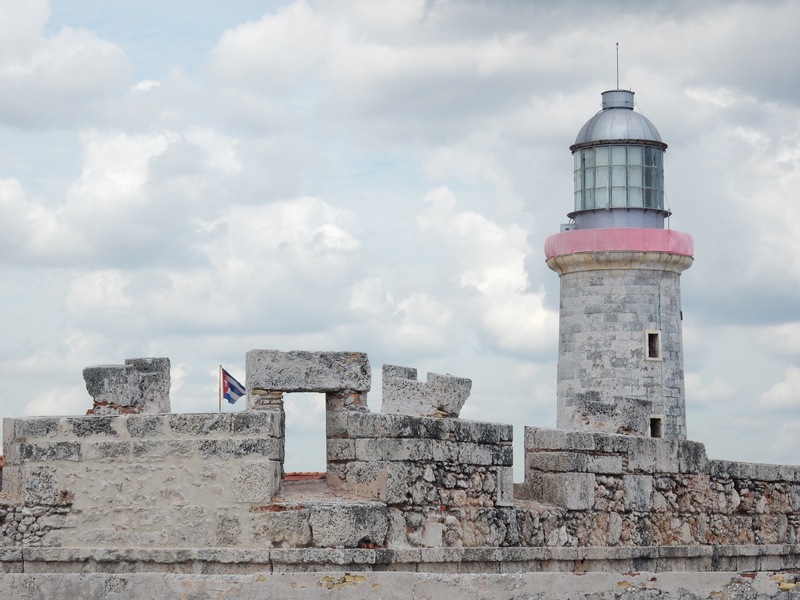 … well with nowhere on the long stretch of Malecon to take cover from the rain I was thrilled to see the Fort cafe not too far away …. I made a dash for it, thoroughly soaked by now and relishing a coffee to warm me up! 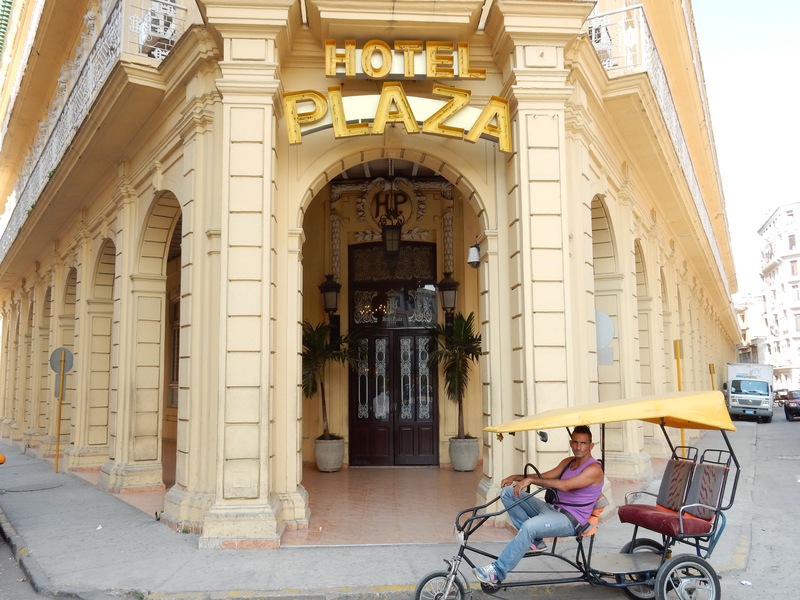 Well ….. as is commonplace in Cuba … their coffee machine was broken, no flan to be had, or indeed anything for a snack other than the ubiquitous ham and cheese sandwich which I politely declined!! Just for the record, I hate ham and cheese sandwiches :)!!! ….. the bar portion however was open and they did have water, beer, daiquiris, Cuba libres … the downpour ensured a near empty restaurant/bar …. literally deserted except for a few Cubans drinking and smoking cigars inside the dark bar in the tower portion of the Fort remnants. 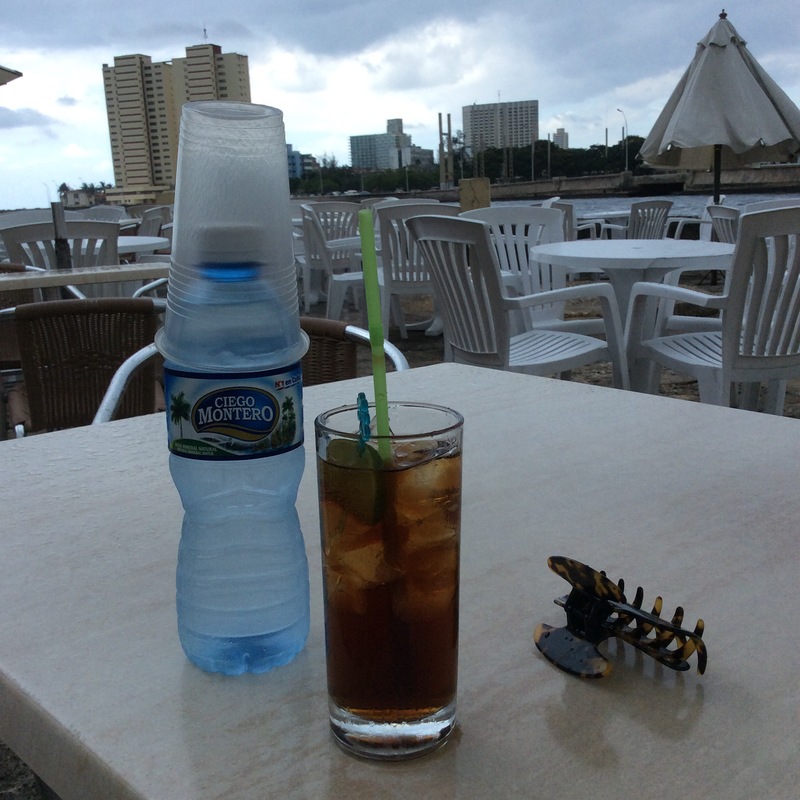 I opted to sit outside under the umbrella despite the rain, sip my Cuba libre … a rum and coke with a twist of lime 🙂 washed down with water …. I am just not one to consume hard liquor but to be polite, I had to order something. My waiter called a taxi for me. TWO hours later, it finally arrived!!! Needless to say, I got to know the kitchen staff and waiters very well … they totally enjoyed practicing their English with me. 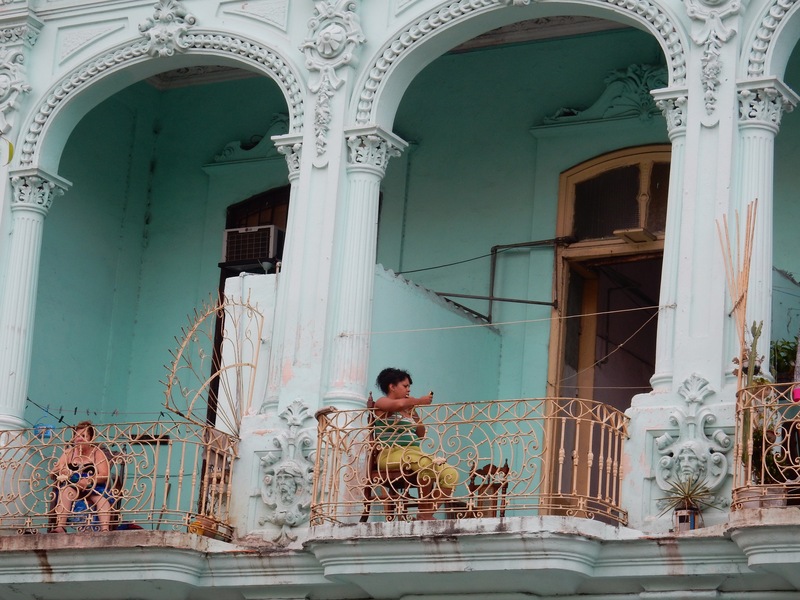 I am sure I eased their rainy day boredom somewhat … In all fairness, I rarely mind getting stuck in these kinds of situations … always a reminder to slow down and savour the moment, whatever the moment … reinforced yet again why I love Cubans …. they were so kind, gracious and downright funny, while we waited together for my taxi in the pouring rain … a cheer squad broke out when the taxi finally arrived. 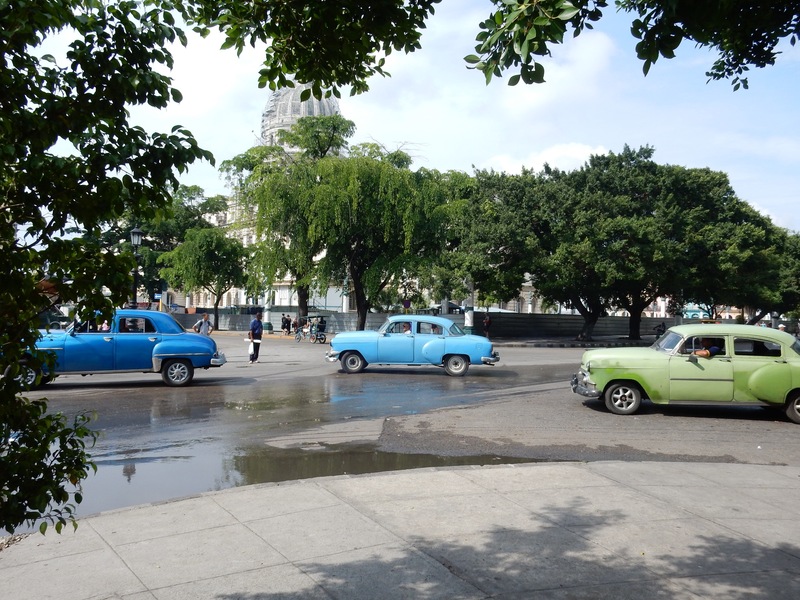 Hugs and kisses were of course exchanged before I ran to the waiting taxi … it is the Cuban way!! I am missing what I have come to think of as my very own little city, Ciego de Avila, so very much today, here in bustling rainy Havana! I had bid adieu on Saturday to the intrepid Americans who became my family for two weeks … well, actually my taxi arrived early so missed a goodbye hug but left a goodbye note instead for Pam to read to everyone 🙂 … The energy shifted dramatically with their departure … more than a little sad so opted for my cure all solution … a long walk!!! Works wonders every time! I have now walked the somewhat dusty streets of Havana for almost two days on my own and with rose tints fully removed, realize it is like so many cities all around our world with three million plus, taking up space, trying to make a meaningful and rewarding life but failing on many fronts … was almost cheated by a very drunk bici taxi dude who demanded five times what the going rate is … the truth is, if he had been respectful and kind, I would have probably given it to him … rude behaviour turns me right off …. ahhh big cities … they do not always bring out the best in us. 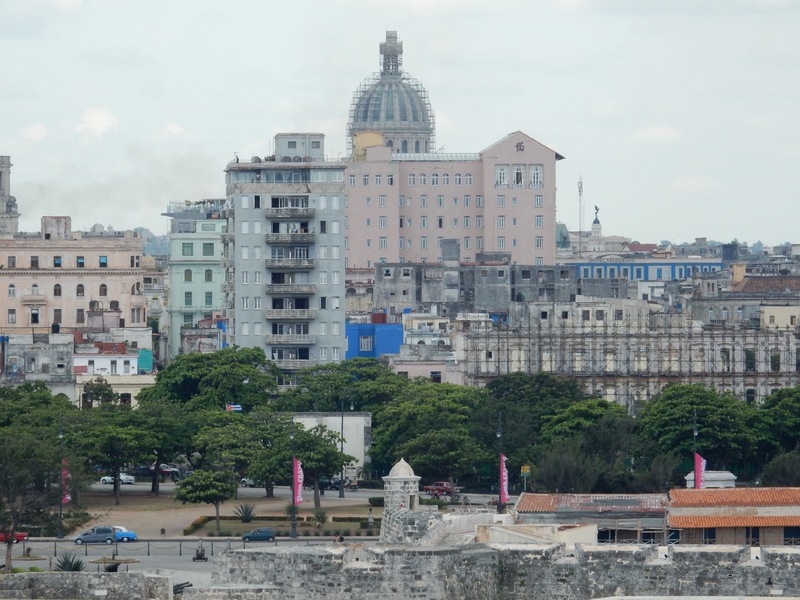 There is so much economic poverty visible in Havana resulting in a lot of unhappiness as people struggle to survive. There is no easy solution to this problem …. the wheels of progress work slowly. 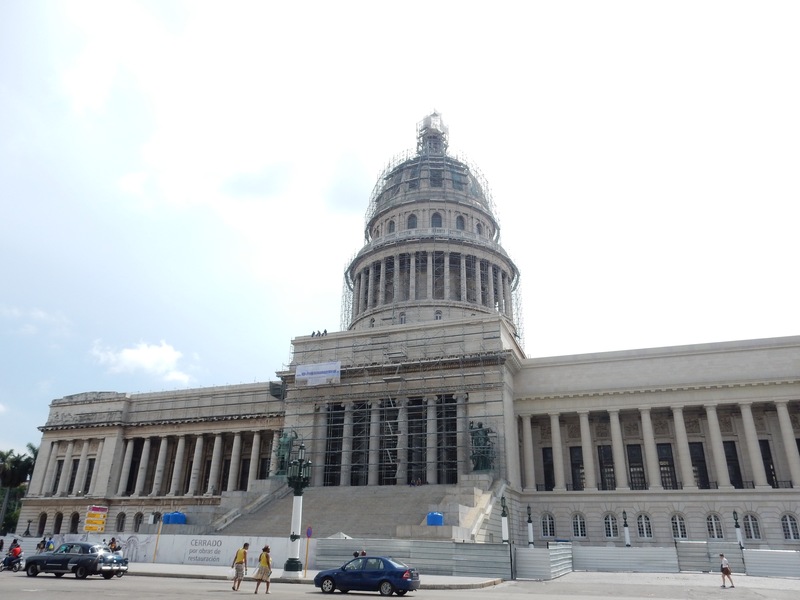 The lofty ideals and goals of Fidel Castro’s Revolution of 1959 remain admirable …. free health care for all, an educated population (Cuba has totally eradicated illiteracy during Fidel’s time in power!) jobs for everyone … many of the social reforms since the revolution have indeed been recognized but like any country in the throes of modern day change, much is left to do. Wondering how the introduction of Western affluence will affect the country in the long run, given it is hardly all it is cracked up to be. 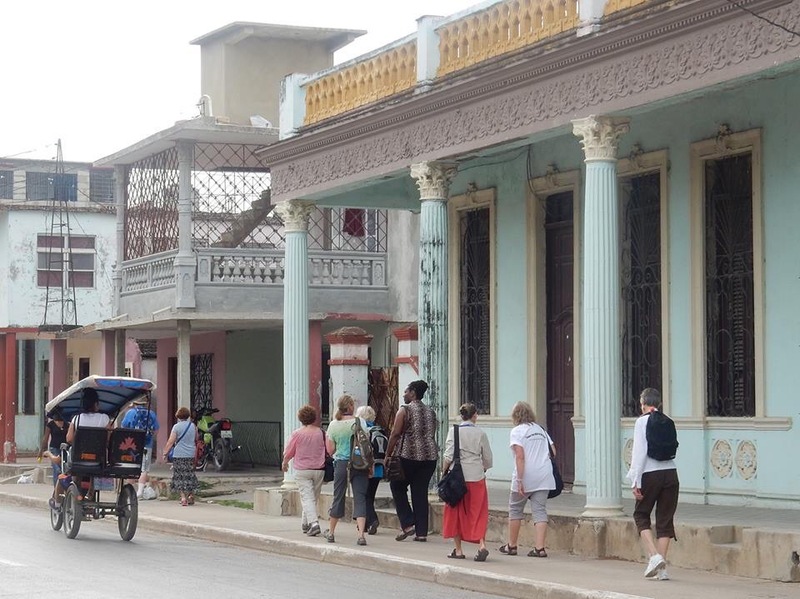 Tourism has been a main contributor to Cuba’s economy since 1980 … Canada certainly contributes with at least a million tourists utilizing the beach resorts of Varadero, Cayo Coco and resorts along the various other smaller islands that hug the coastline of Cuba. I feel a deep shame however, knowing that the best food available in Cuba is fed to tourists at all the five star all inclusive resorts, while the small towns and indeed Cubans in Havana do without and have so little of everything … except mangoes!!! …. 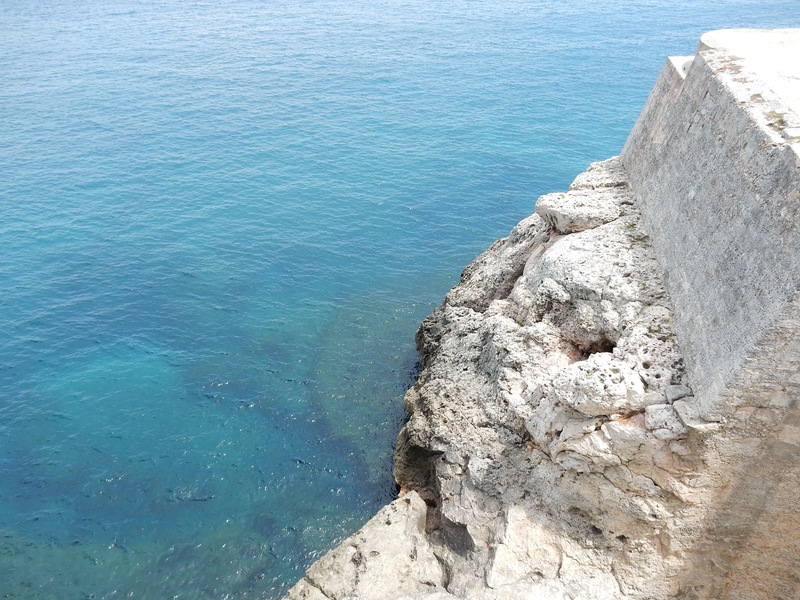 it remains the plague that is tourism …. brings in foreign currency but at what cost? 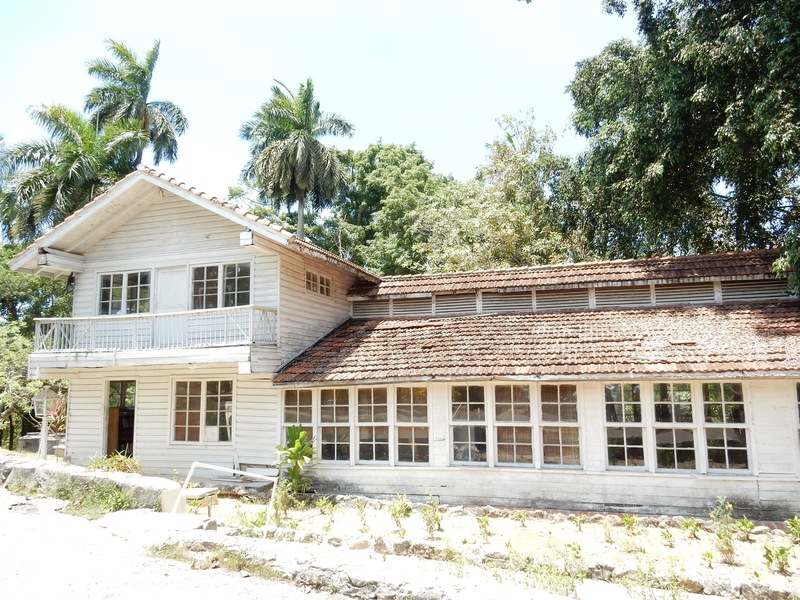 Disappointment hit hard as I taxied to Vedado to the Che Guevara Museum this morning, only to find it closed for the next two months! Che remains an enigma for me and I devour whatever history I can find about his life …. I adore a heroic rebel and he certainly is that for me and most Cubans! 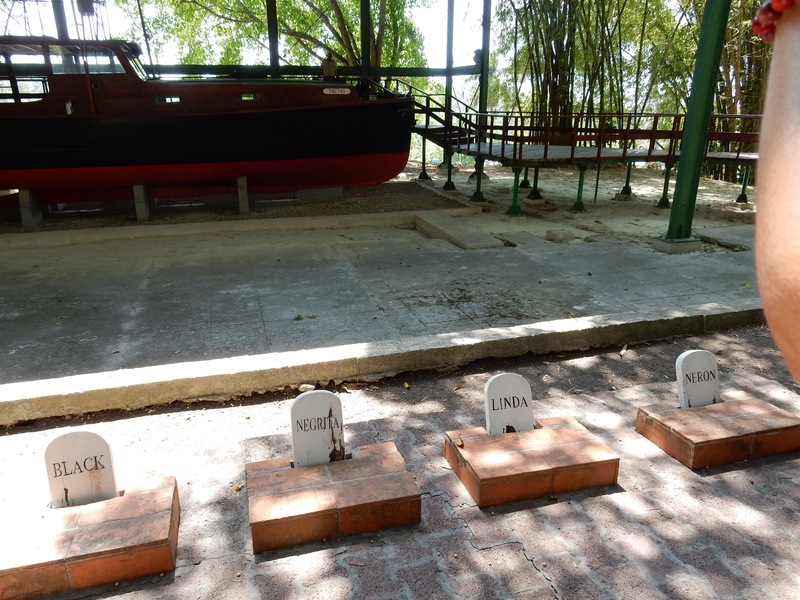 Despite being Argentinian by birth, he is buried in Santa Clara, central Cuba. Che is only one of two foreigners to ever be awarded the distinction of being declared a citizen of Cuba “by birth”. 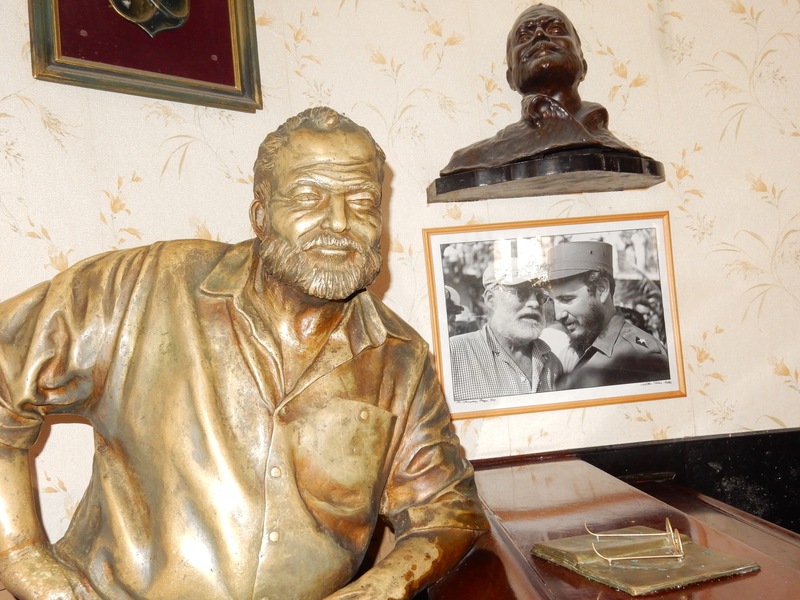 He was Fidel’s first mate in the war against Batista and freeing Cuba from his grasp … Viva la Revolucion!! …. the young doctor rebel was reportedly later assassinated in Bolivia by order of the CIA … my American mates understandably dispute this claim, declaring it an unsubstantiated rumour. I think not. Che was a mixed bag …. an educated man, a medical doctor, loved books, sports, had a great spirit for understanding the necessity of sacrifice, possessed an iron strong will, a perfectionist with apparently a great sense of humour, loved beauty, a man of action who found time to think, meditate and write!! Surely a complex rebel the likes of which we rarely encounter in life. I would have enjoyed interviewing him or heck, shared a Cuba libre in a ‘son’ music bar and tangoed with him …. oh right …. forgot I don’t know how …. on my list of things to learn …. dance Latin style :)!!!! 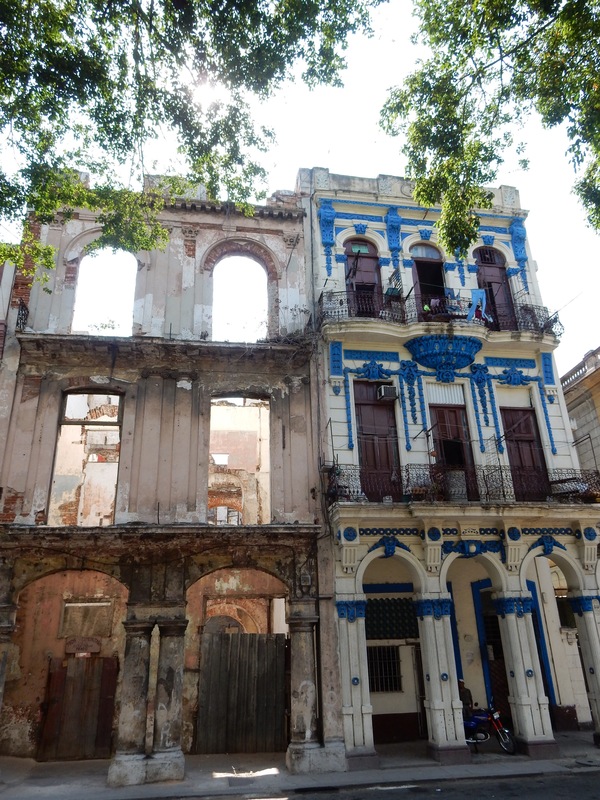 Economically, Cuba has had it rough for decades. 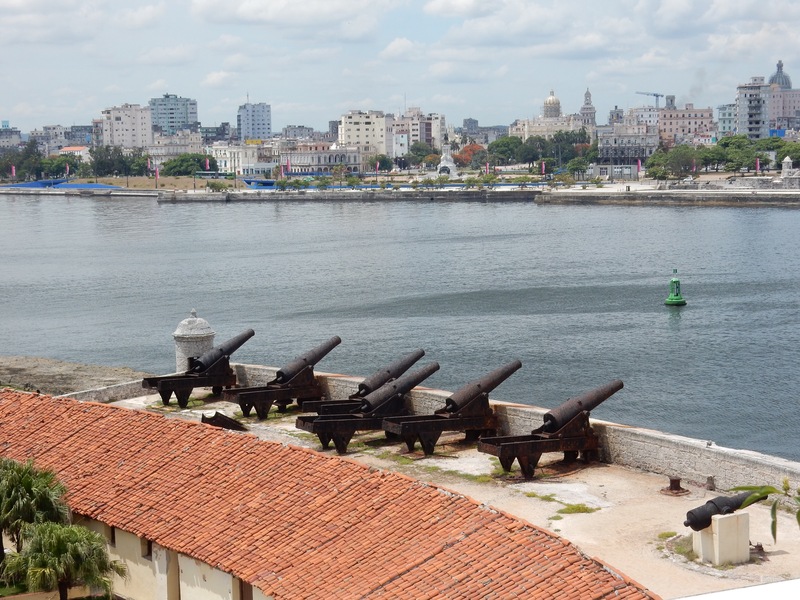 The U.S. embargo from early 1961 has not been easy on the country and Russia abandoning Cuba in the 1990’s made it worse. Economically they have suffered greatly and are working at restoring and rebuilding their country …. the process remains slow and tedious …. communism certainly did this country no favours but then again, neither did capitalism! Both countries, in my humble opinion, used a small country like Cuba as a pawn, given its strategic location, all the while flexing their Cold War super power muscles with nuclear threats! Apparently Cuba is currently experimenting with a cooperative style of doing business, but it is still in its early days. Cuban government is well aware that capitalism is not the answer anymore than is a communistic approach. They are working through alternatives and I wish them well on this quest. 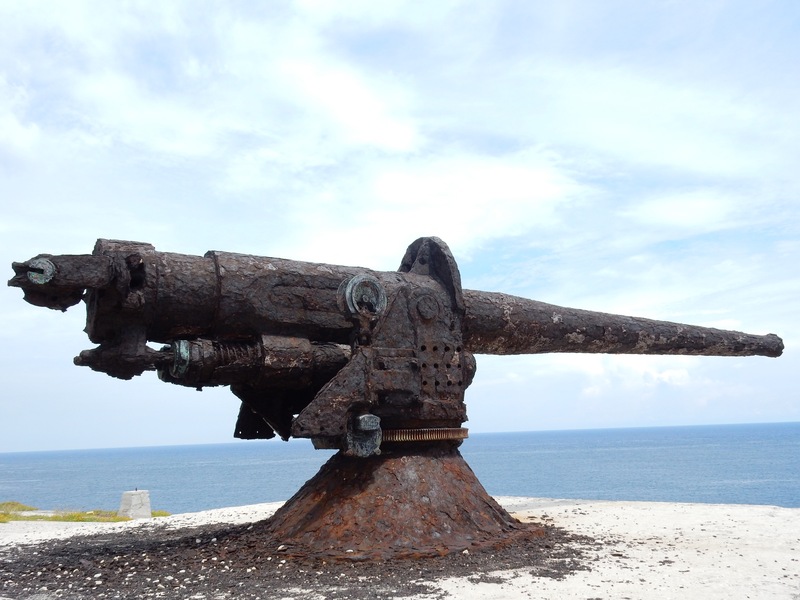 They are a strong people who over hundreds of years of history, have survived and even thrived at times, despite attacks by Pirates and Buccaneers, Spanish and British invasions, American isolationism and embargoes, an economic alliance with Russian that turned somewhat sour ….. I sincerely hope that the highly moral stature of the heroes of the revolution, Che and Fidel to oust Batista were not just a blip on the dial of Cuba’s evolution, but an indicator of the strength possible when people unite in a just cause. I believe the Cubans will prevail. We in the West are also needing some major tweeks to our democracy. Our world will remain an interesting evolving place as all our countries search for better answers to the economic disparity that plagues us all. 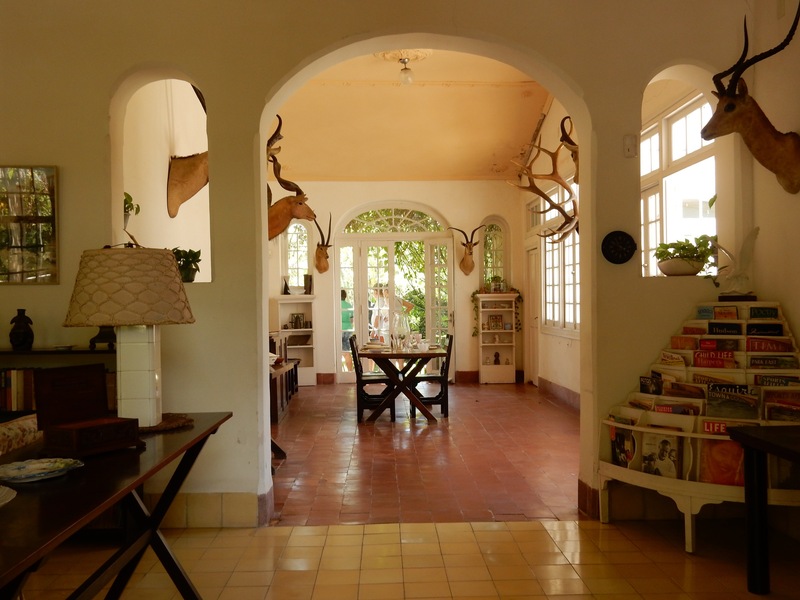 Yes, I am certainly enjoying the museums, forts, cafes, Ernest Hemmingway daiquiri haunts …. I raised a glass to the fine writer at La Floridita with his signature daiquiri …. rumour has it that old Ernie helped craft the drink while undoubtedly drinking his fair share of them!! …. 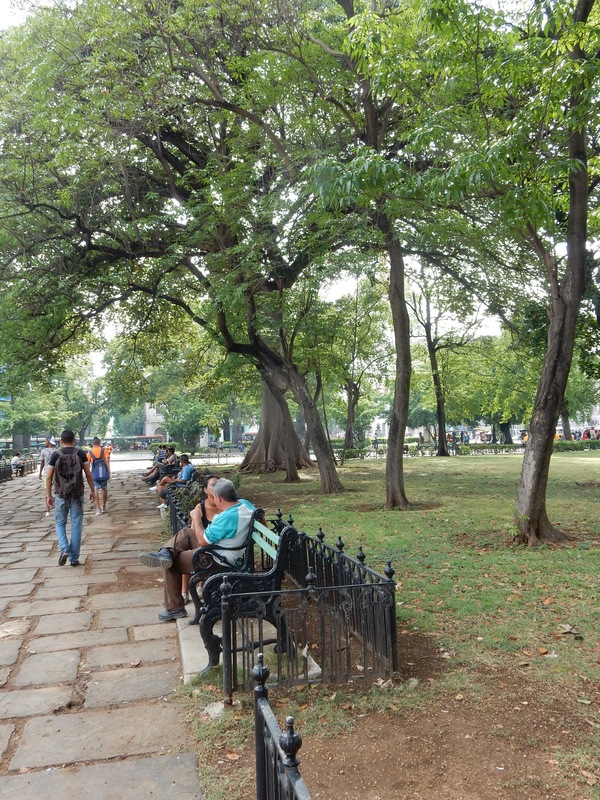 I stroll through the old town Havana parks that are actually quite lovely, clean and pleasant to walk through or sit a spell on a bench or concrete slab of wall, savouring the sites, the people watching, the overall ambiance, certainly unlike any other big city I have explored … uniquely Cubanesque!! 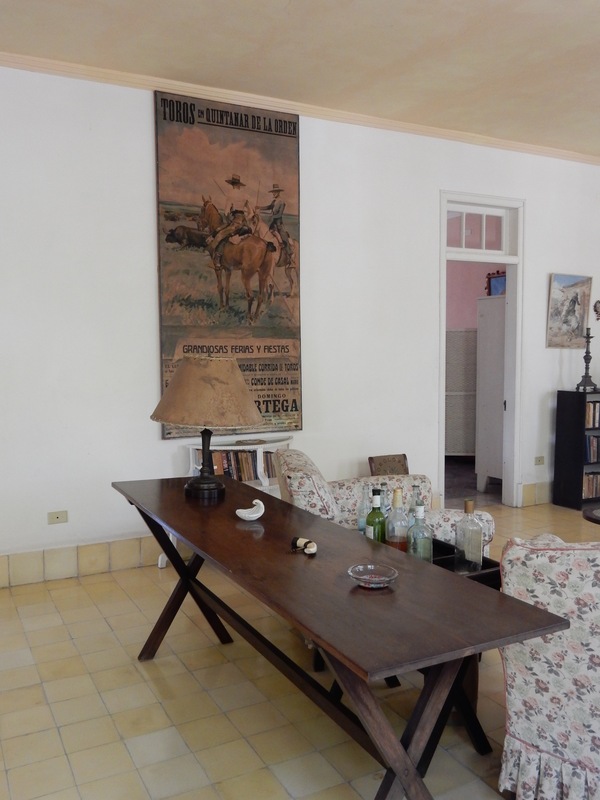 But I find myself yearning for the simplicity of life in Ciego … the warmth of its people …. who we came to know so well in a short period of time. As a group, we were so warmly welcomed and accepted, even if at times they appeared puzzled by our very presence in their wee town. 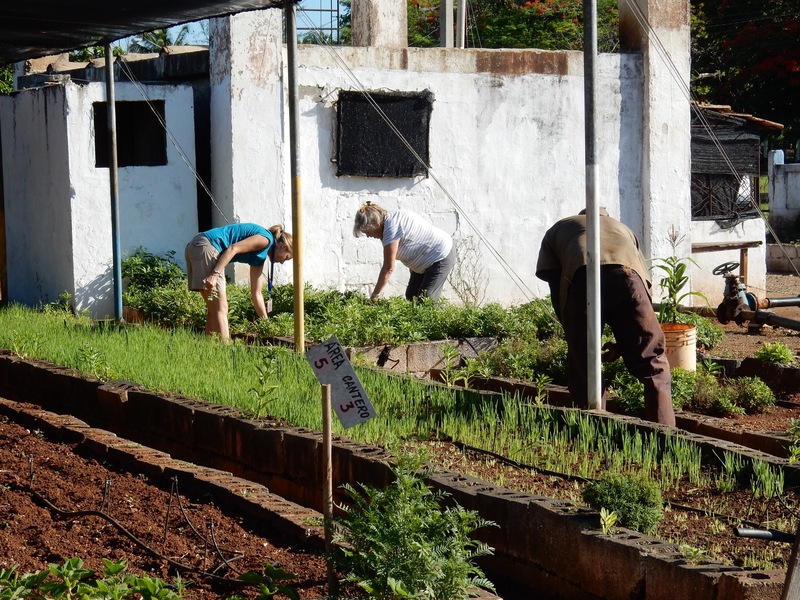 This was after all, the first U.S. Volunteer posting in Cuba … I am sure the gardeners must have been wondering at one point, if we were taking over their jobs 🙂 …. No danger of that as Holly and I had our knuckles almost tapped more than once by sweet Lewis, while we pulled plants rather than weeds …. I had no excuse, having tended gardens my whole life 🙂 but Holly was a novice! They all came to know in quick order, that all we want is to promote peace and goodwill between our countries. Learned Havana airport was built with the help of Canadians … something Eduardo our country host shared. Also very cool to learn ……. 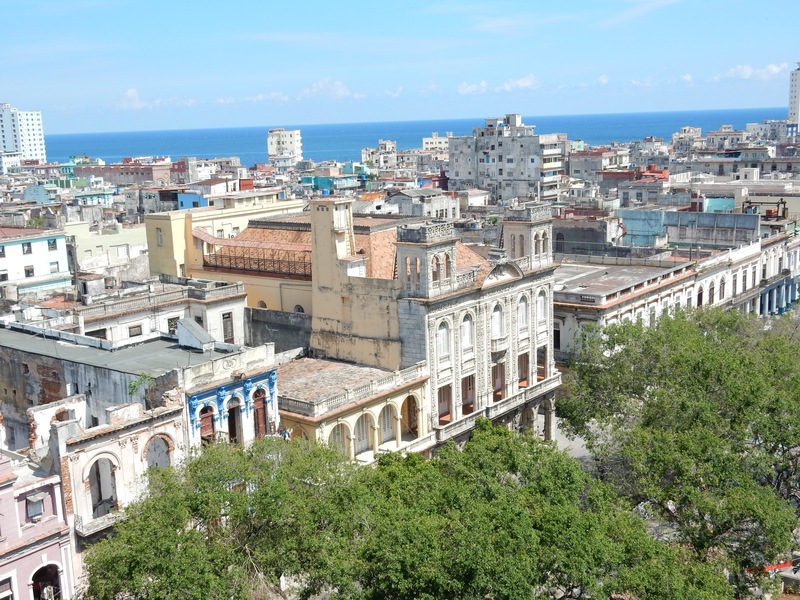 while we were all here together, Cuba was finally taken off the USA ‘terrorist list’ ….. bless Obama … about darn time! 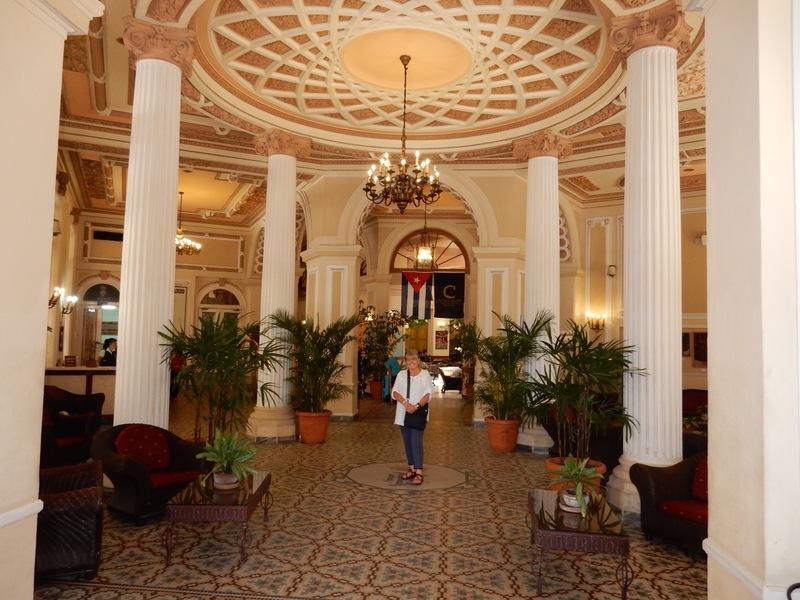 I am currently holed up at the historical grand old lady of Havana’s hotels …. 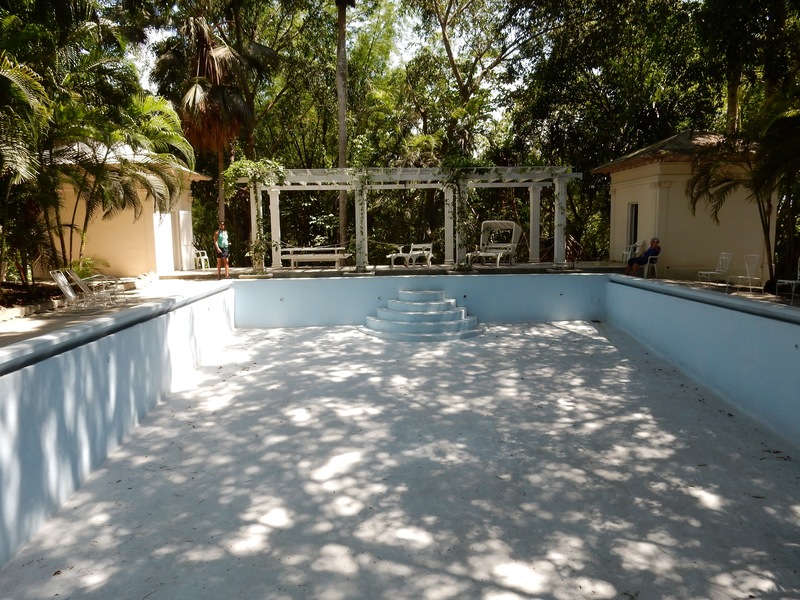 The Plaza, with a history of hosting many greats during its illustrious distant past ….. Isadora Duncan flinging her whimsical scarves once breezed through, Caruso serenaded his way through Havana while hanging his hat at the Plaza, Pavlova danced to adoring audiences …… wonder if she slept in my dilapidated room 🙂 …. A hotel now reduced to a glorified hostel style of accommodation. Rumour has it that a Canadian company will be restoring the Plaza in the near future! Hope so as the location in the centre of old town is fabulous!! 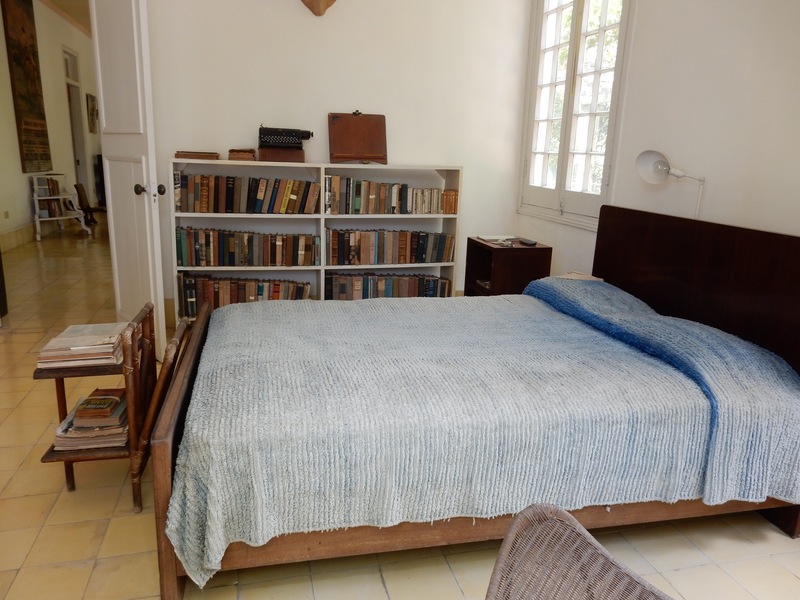 Havana is hosting an international art festival for the next few weeks hence the inability to score a hotel room anywhere it would appear ….. 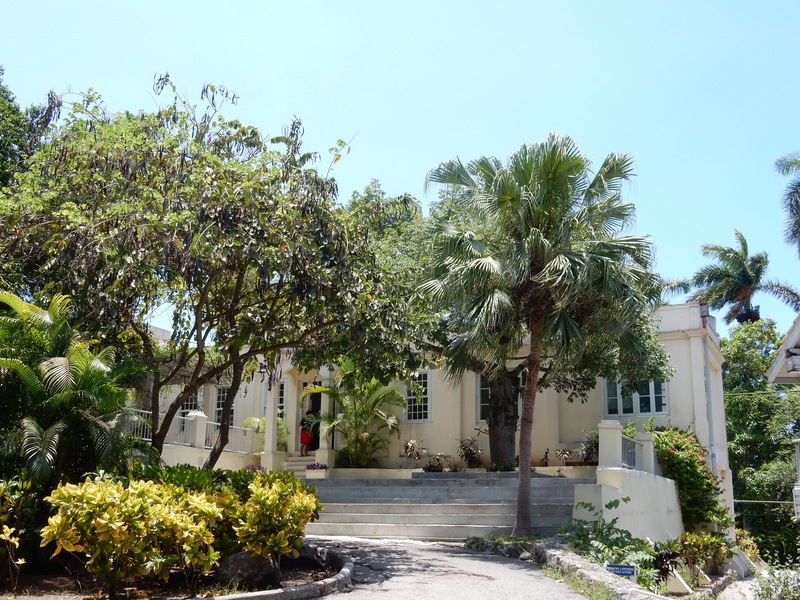 I have personally walked into every hotel within walking distance and beyond into Vedado area with a taxi, only to be politely told …. “so sorry but we are full”!!). The Plaza is literally crumbling around me … the price is unbeatable at $40 a night, what one would pay for a hostel in most parts of the world and hence is full of young backpackers or sorts like me, caught in a lurch with no place to stay but here. 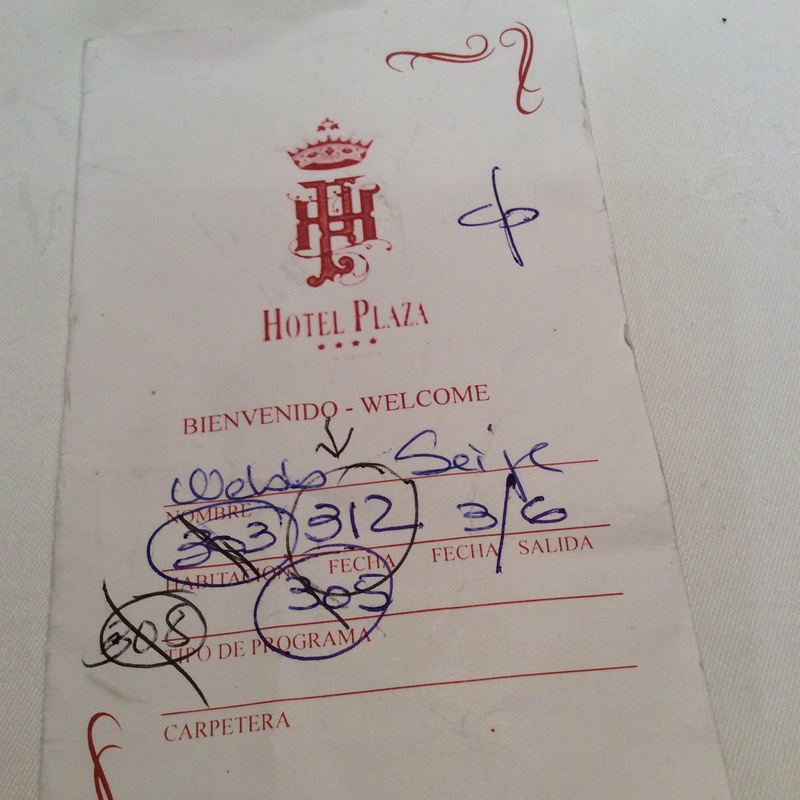 I had to switch rooms four times after checking in … will post a picture of my room card with each change documented … shortages of everything are commonplace in Cuba and nothing is wasted, including the key card holder :)!! 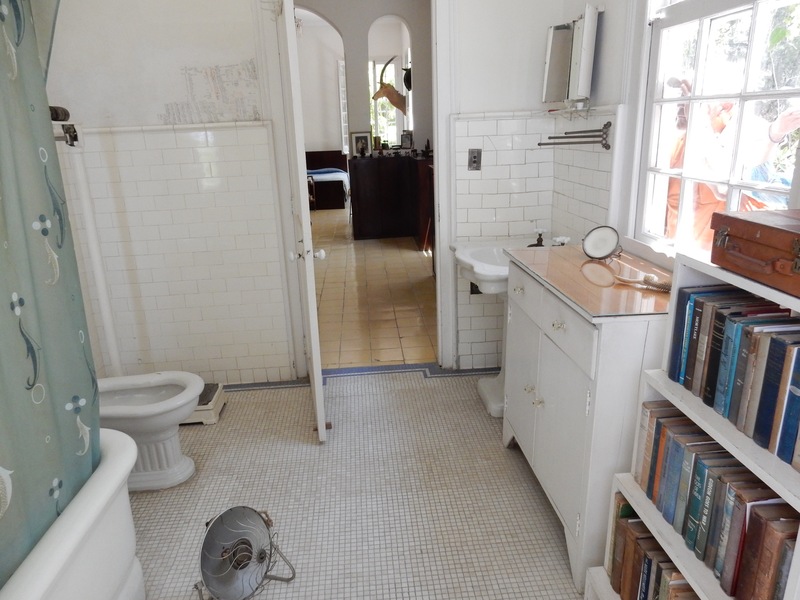 The first room had an air conditioner but lacked a plug-in attachment or indeed an outlet to even plug one in …. God forbid I request an extension cord in a country with such a lack of everything imaginable …. 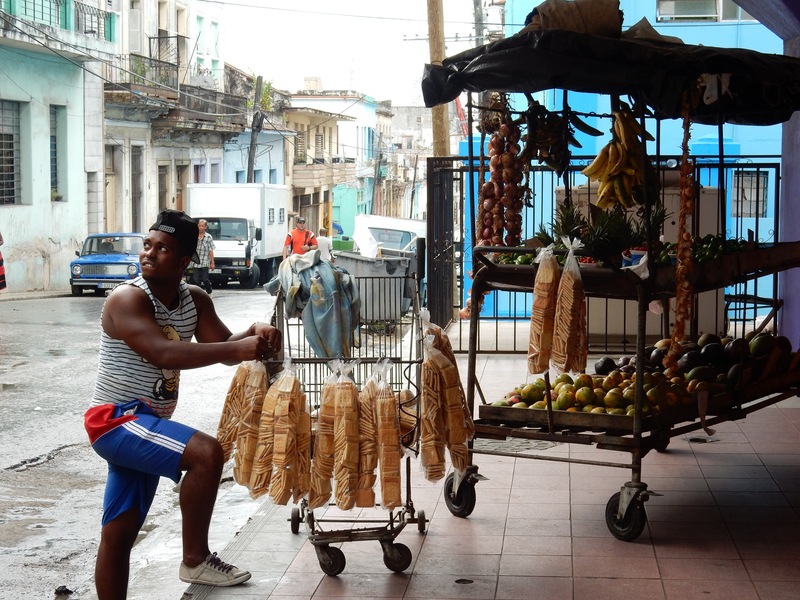 I have coined every market in Cuba an “everything store” …. when I request a drug store or a grocery store, I am invariably guided to a store that has a handful of hodgepodge drug store items, coffee pots, a bicycle, children’s clothing, shoes, laundry soap, washing machines, bolts of cloth, a handful of plumbing supplies, bars of soap, toys for children, rum, cigars, a handful of fresh produce but ironically, rarely what I am looking for :)!!! …. the shelves hold so little of what a North American is accustomed to seeing. The second room I was assigned had a collapsed mattress and head board that slipped and fell on my finger as I tried adjusting the matresss … finger okay now but may lose the fingernail! The next room had a plumbing problem and water flooded the bathroom floor from the toilet tank that was continuously running and overflowing … almost slipped walking in to check out the bathroom but no one seemed in the slightest concerned about leakage to the floors below 🙂 …. once I checked into 312, I discovered the lights only worked in the bathroom! …. at that point I gave up and said to myself … “Seija, you did not really want to read at night anyway … and you can surely find your way to the bathroom in the dark, right?? ?” In all fairness, they did send maintenance in the next day and voila, I had light to read by after maintenance worked on the problem all morning :)!!! But all complaints aside, I am secretly thrilled and welcome a room challenge :). It is why I travel … to experience life in all its complexity … and if I continue to repeat that mantra, surely I will start to believe it :)!! Back to Ciego …. teaching rudimentary English to eager young people in the evenings was a blast! I love Cubans!! 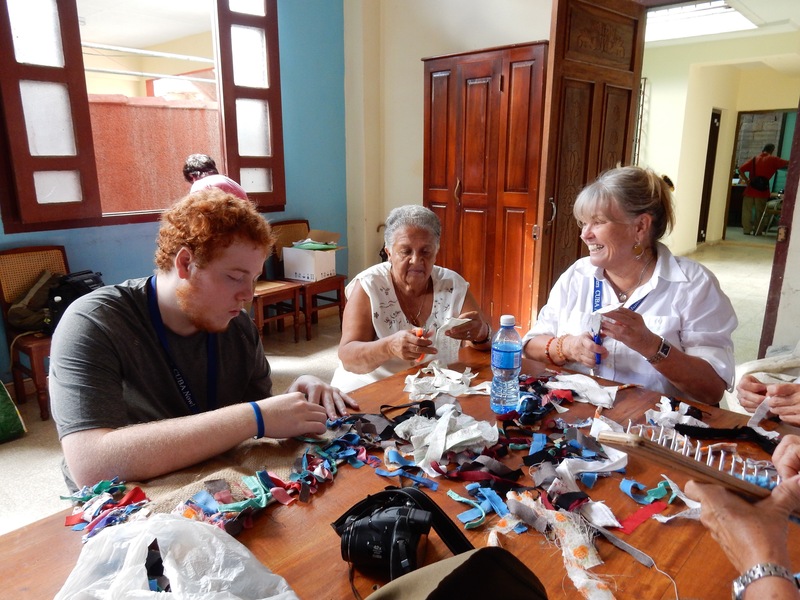 Their young eager faces flood my memories as I sit here in Havana. 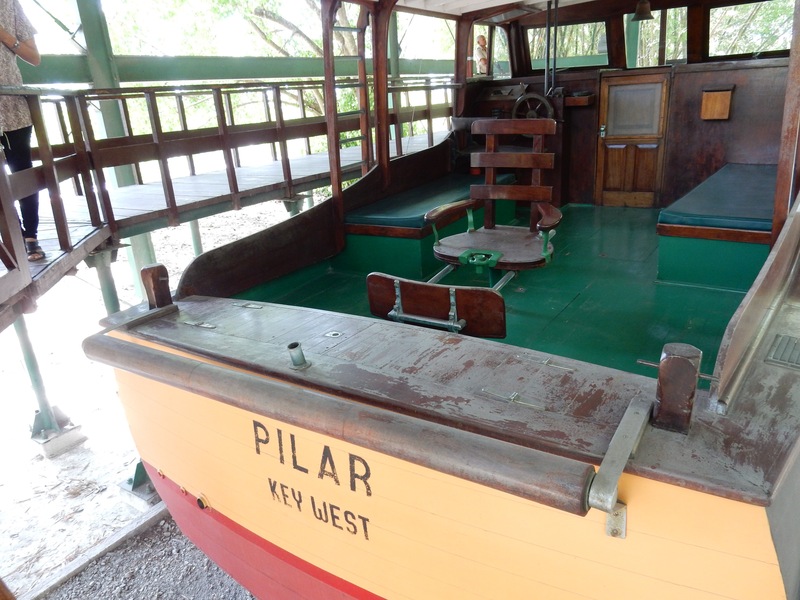 The English was the conduit but the goal was creating connections with Cubans, spreading goodwill and peace. I know we succeeded. Cubans are a warm passionate people and hug and kiss when greeting or saying goodbyes. I will miss that in Canada and may add it to my own salutations from now on!! …. Who in the whole wide world does not benefit from hugs and kisses?? 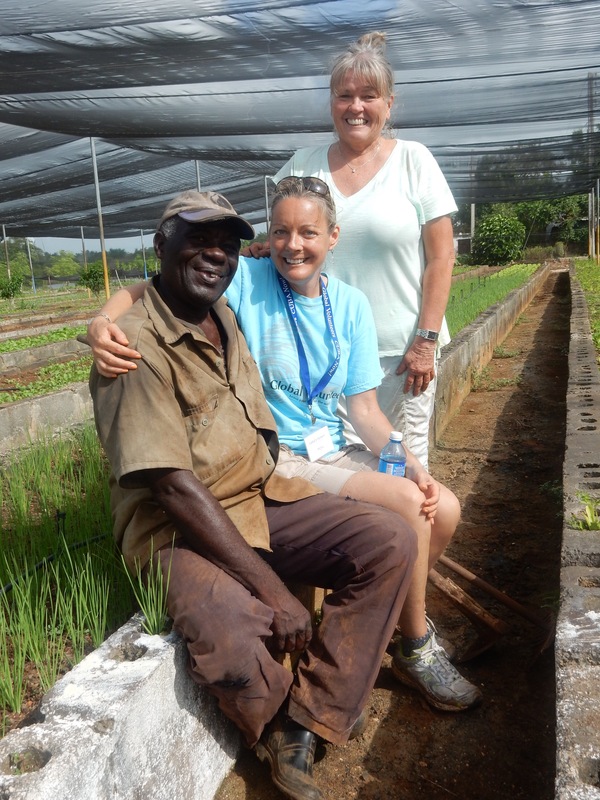 Gardening in the mornings with my teammate Holly and Lewis our Cuban garden partner was beyond fun …. Holly has simply been a delight from the moment I met her at Santa Clara airport where she greeted me with her signature “I Love Cuba” and Lewis, who spoke not a whit of English but it made no “nevermind” at all!! ….. we had a rather original form of communicating, I totally relying on Holly’s limited vocabulary …. the ‘limited’ part was something I only discovered much later, being the naive gullible sort I tend to be at times …. (Holly chatters along amiably in Spanish using all the words she knows whether they make sense or not and had me totally fooled 🙂 and Lewis was so smitten by Holly that he just smiled a lot and probably didn’t care as long as Holly kept talking to him :)… so with Holly’s charming Español rambles, mixed with my combination of sign language and limited vocabulary and Ramon’s translations (our Cuban host Eduardo’s assistant) … when he was available), we made it work! ….. all in all, it just doubled the fun! I loved every moment and miss it all enormously. Unfortunately, I accidentally deleted my pictures from the first week and currently cannot share these moments via photos and am trusting that I receive downloads from my teammates at some point. I will post what few pictures I have … we kept a team journal that I also hope to share on my blog …. I had very articulate team members that describe our days so well that I dare not even attempt to repeat, given that documenting details is not my forte …. I leave that to the experts on my team and will willingly share them at some point.